(Newser) – A Florida high school agriculture teacher has been accused of drowning wild animals in a trash can as students watched and participated, CBS reports. The animals included a raccoon that had eaten one of the chickens the class was raising. “It made me sick. It made me sick to my stomach,” says the mother of a student who took surreptitious pictures of the event. 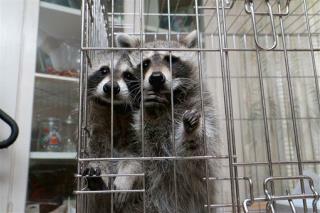 The teacher reportedly trapped the raccoons in metal cages, then lowered the cages into water-filled trashcans. "My son stood in the background, hid his phone and watched as they filled these trash cans full of water, and held these raccoons down in trash cans in the cages,” she tells FOX. I don’t like opposums and raccoons. (I’m afraid of them.) However, what that teacher did was awful and cruel. And to have the kids watch? WTF!